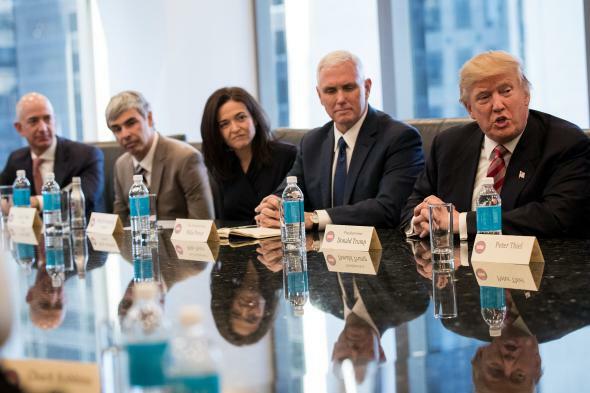 Sheryl Sandberg’s Lean In strategy is spectacularly mismatched to a President Trump. Sheryl Sandberg was among tech leaders who met with then Vice President–elect Mike Pence and President-elect Donald Trump at Trump Tower in December. Sheryl Sandberg, I’ve been known to observe, is the ultimate conciliator. Her 2013 cri de coeur Lean In was less feminist jeremiad than soothing you-go-girl manual, offering an explanation of corporate etiquette for the woman who wants to get ahead. This, of course, is how Sheryl Sandberg would like us to understand her approach to Donald Trump. A segment of the feminist community has been more than a bit dismayed by Sandberg’s relationship with the man now occupying the White House. First, she, along with other tech executives, met with Trump back in December. She skipped the historic women’s march and didn’t initially say a word about it, not even a Facebook post. Grumbling finally broke out into the open about a week ago, courtesy of Sarah Lacy at Pando. “I understand that Sandberg is in a brutal position, but that is the thing about standing up for what’s right. It only means anything when it’s inconvenient,” Lacey wrote. In other words, we need to talk. “I think it’s early – I can’t sit on this stage and predict (and predict) what will happen,” Sandberg said at another point. “I have to remain hopeful,” she repeated more than once, much the way a self-help guru might chant an improving mantra. As for that women’s march? A “personal obligation” conflicted. Then she “didn’t feel comfortable” posting about it. Let’s get real. What sign, perchance, is Sandberg waiting for? In the less than two weeks since Trump took the oath of office, he has signed an executive order all but banning immigrants from seven predominantly Muslim countries, claiming he’s concerned about terrorism but excluding sometime terrorist exporter Saudi Arabia, where the Trump Organization has business interests. Trump signed another executive order stopping government funding of groups that offer or even discuss abortion in other countries. Trump’s threatened to send troops to Mexico. He plans to sign an executive order Friday afternoon that will almost certainly result in a significant rolling back of the Dodd-Frank financial regulations. And he’s lied so many times, it’s all but impossible to keep track of the whoppers. OK, OK. Sandberg’s donated $1 million to Planned Parenthood and posted on Facebook about her opposition to the Trump administration’s global gag order on abortion. She since also posted about her opposition to what has been described as the Muslim ban, which not only stops immigration from seven predominantly Muslim countries to the United States for a 90-day period but also prioritizes members of persecuted religious minorities (i.e., Christians) from those countries for admission to the United States in the future. And, yes, an argument could be made that Sandberg has less room to maneuver than we think. She’s a corporate officer of Facebook, after all, and has a legal duty to do right by the company and not harm its financial prospects. So, this line of thinking goes, she can’t quibble publicly with Facebook board member and Trump supporter Peter Thiel or independently critique Facebook’s role in promulgating fake news in the weeks before the November election. Still, Sandberg’s model in Lean In is not the one this resistance moment needs. Trump is not a man whom an underling could have a productive “dialogue” with. If reasoned conversation worked with him, surely we would know it by now. Instead, in Trump’s world, it’s bully or be bullied. It’s no surprise Sandberg can’t bring herself to admit Trump is impervious to reasoned conversation. One thesis undergirding Lean In is that discrimination against women, in many cases, is unintentional bad behavior, perpetuated by otherwise well-intentioned men. We simply need to acquire the right skills (and stamina! ), the book argued, so we can work out way into a position where we can explain to the (mostly) men in power why they need our help. Then, presumably, progress will occur. Of course Sandberg believes this. It worked for her, after all. Her genius is in getting along, and coming with the pedigree—white, affluent, Harvard-educated, Larry Summers-mentored—that gives her the necessary access to power to demonstrate her skill. Among the stories in the book: When pregnant, she realized Google lacked parking spots in its lot for women who are expecting. So she “waddled” into Sergey Brin’s office and “announced” the need for them. And so it came to pass. Most of us come from less privilege, and we spend our lives in less rarefied terrain. Blue- and pink-collar life rarely works this way. Lean In was never about challenging the system. It was an updated manual for cooperating with authority so you could make a run at the corner office. In retrospect, the American embrace of it might demonstrate how all too many of us have bought into the language of the self-help movement, not to mention the myth of the heroic businessman (and woman) that’s so pervasive it just got an unqualified man elected president. There’s nothing wrong with writing a self-help guide. But if your stated goal is to get along, chances are good—nay, excellent—that you won’t be the sort of firebrand that challenges people in a direct way. You won’t, to steal a phrase Sandberg used herself, be “comfortable” confronting authority. One of the things he told me was that my desire to be liked by everyone would hold me back. He said that when you want to change things, you can’t please everyone. If you do please everyone, you aren’t making enough progress. Mark was right. Sandberg tells this story as a way of showing that she’s changed. Au contraire. She’s the same people-pleaser who believes the best progress is made not by being angry and demanding but by being measured and likeable. There’s a time and a place for that, but in our current moment, it’s not the recipe for progress.